A new month comes with a new ACTive Local of the Month. This month, the Dutch local AEGEE-Utrecht was elected for covering all of the Focus Areas of the Strategic Plan within one month organising four different activities. We spoke to the President of the local, Folckert van der Molen, to find out more about this local and their Action Agenda involvement! First of all, can you tell us a bit more about your local? 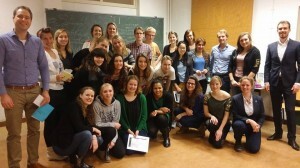 AEGEE-Utrecht was founded in 1987 by a group of local law students. Now we have grown to be one of the largest locals in the network, with nearly 300 members. It is headed by a full-time board of five people. In total there are about 20 committees with a total of 125 members in active positions. This allows for a full calendar of activities, with an average of 3 activities per week. Which activities related to the Action Agenda/Strategic Plan did you organise? We organised a workshop on professional profiling, an international night, a vegetarian dinner and an outgoing exchange with AEGEE-Budapest. Our workshop, contributing to the Focus Area of Youth Employment, aimed to teach participants how to profile themselves in the labour market. A lot of present people later mentioned they found it very inspirational and helpful. Our International Night, contributing to the Focus Area of Spreading Europtimism, was organised in cooperation with other internationally oriented student associations in Utrecht and gave us the chance to bring together international and local students for a memorable night. 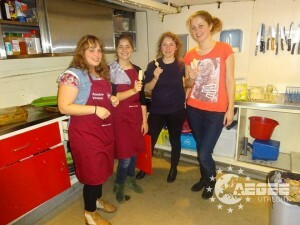 Our vegetarian dinner, contributing to the Focus Area of Civic Education, contributed to the 40 days without meat action organised by AEGEE-Leuven. One of our committees already organises dinners for our members once every month around a theme. This time they decided to go with a Greek and vegetarian theme. Although the Greek cuisine is known for their delicious meat dishes, they managed to create some outstanding vegetarian Greek dishes. Last but not least, our exchange, contributing to the Focus Area of Youth Mobility, was organised in cooperation with our twin antenna AEGEE-Budapest. As part of our twin antenna agreement, we hold at least one exchange per year. This time, we also invited AEGEE-Barcelona to join us for five days of sightseeing, fun and new and old friendships. As one of the larger locals, we feel we should strive to maximize that potential. That’s why for every idea for an activity, we ask ourselves a simple question: is this a true AEGEE activity? That means, how do we contribute to the goals we set out to achieve? For all these activities we think we managed to give the real AEGEE spirit to the participants and certainly bring Europe a little closer to home! What were the results of your activities? Actually all activities had a great number of participants. The International Night for example attracted almost 500 people. For the exchange we even had to disappoint some people for whom there was no more room. Even the workshop had a pretty good attendance, while we have in the past found it difficult to get a lot of people for that kind of activity. Do you have any other activities related to the Action Agenda planned? Our plans mainly focus on getting our members more active in Europe and not only in Utrecht. While not directly related to a specific focus area, this should have a positive impact. That said, we do have a couple of activities planned. For example, a hitchhiking competition in cooperation with other locals, or a trip to The Hague, to visit the Humanity House where you can experience life as a refugee. Also, we are one of the organising locals for the Democracy in Practice training courses, which of course is a big contribution to the Civic Education focus area. There are more examples, but let’s not name them all here! Do you have any other big plans for the upcoming year? Always! We are planning to throw the best gala we have ever seen, in the most amazing location available in Utrecht. Shortly after that we will celebrate our birthday and have a lot more activities that together we call our theme month. This year the theme is stories, which gives a lot of room for great activities. In the summer we will organise our Summer University “Meet your new partners in crime”, in cooperation with AEGEE-Delft and AEGEE-Amsterdam. 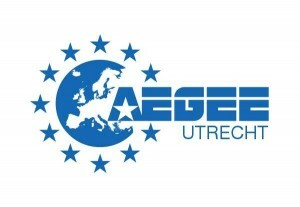 And after that the focus will be on recruitment and introduction, because before the start of the next academic year we hope to find about 100 new members for AEGEE-Utrecht. Why should other locals organise activities related to the Action Agenda? 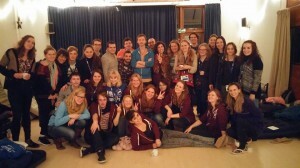 Because any organisation can throw social nights or whatever, but as AEGEE we can do much more than that. Our whole raison d’être is to make Europe more connected and to be the voice of young people. 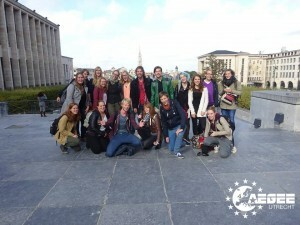 The AEGEE network provides amazing opportunities to make an impact. It would be a waste not to take advantage of that! Involve as many people as possible! It is tempting to do everything by yourself or even with just the board members, since a lot of times it’s even more efficient that way. A big part of the impact of organising these kind of activities however is in giving people the experience to organise and connect themselves to the European Project. Get some inexperienced members on the team or find partnerships with other associations. The joy of seeing other people grow is just as great as putting all the pieces together yourself. Which objective of the new Action Agenda do you look forward to working with the most? Actually I am pretty happy about all of them. As we have many active committees, it is up to them to decide what they think is interesting or important. We don’t need to focus on just one of the aims. AEGEE belongs to all members and I am looking forward to seeing what each of them comes up with on their own. As President of AEGEE-Utrecht I am looking forward most of all to facilitating all the crazy ideas they bring to us and supporting them in making them a reality.